Not to be confused with Truman College. Truman State University (TSU or Truman) is a public liberal arts and sciences university located in Kirksville, Missouri, United States. It is a member of the Council of Public Liberal Arts Colleges. It had 6,379 enrolled students in the fall of 2015, with 6,039 undergraduate and 340 postgraduate students, pursuing degrees in 50 undergraduate, and eight graduate programs. The university is named after U.S. President Harry Truman, the only president born in Missouri. From 1972 until 1996, the school was known as Northeast Missouri State University, but the Board of Trustees voted to change the school's name to better reflect its statewide mission. Truman State is the only public institution in Missouri that is officially designated to pursue highly selective admissions standards. Truman State University was founded in 1867 by Joseph Baldwin as the North Missouri Normal School and Commercial College. Baldwin was a pioneer in education, and his school quickly gained official recognition in 1870 by the Missouri General Assembly, which designated it as the first public teaching college in Missouri. Only 25 of Missouri's counties were designated as the school's college district, including Adair, Audrain, Boone, Callaway, Chariton, Clark, Howard, Knox, Lewis, Lincoln, Linn, Marion, Macon, Monroe, Montgomery, Pike, Putnam, Ralls, Randolph, St. Charles, Schuyler, Scotland, Shelby, Sullivan, and Warren. Purple and white were adopted as the school's official colors after Basil Brewer wrote a school song entitled "The Purple and the White." They have remained as the school colors since. In 1924, a fire destroyed old Baldwin Hall and the library. The lake that once filled the current quadrangle, or "The Quad," (a prominent feature in pre-1924 photographs) was pumped dry in a futile attempt to douse the fire. The Quad now serves as a popular gathering place where students study, play games, hold events, such as small concerts and fairs, and meet with one another. The college was renamed Northeast Missouri State University (NMSU) in 1972 and the university was awarded the G. Theodore Mitau Award for Innovation and Change in Higher Education by the American Association of State Colleges and Universities in 1983. Northeast Missouri State continued pushing for excellence. On June 20, 1985, Governor John Ashcroft signed a bill that designated the university as Missouri's only statewide public liberal arts and sciences university. This changed the school's mission to a statewide rather than a regional (northeast) objective. As such, nearly 100 programs were dropped in the span of six years, including all two-year programs that did not fulfill the liberal arts mission. By the 1990s, the university was no longer solely a teachers' college, but also had a nationally known accounting division and schools of science, mathematics, computer science, and literature. Just 10 years after Governor Ashcroft's designation, Governor Mel Carnahan signed legislation renaming the school Truman State University. The university is designated by statute as Missouri's premier public liberal arts and sciences institution. In the 2016, U.S. News & World Report College Rankings, Truman placed eighth in the Midwest among regional universities. Truman's Board of Governors consists of ten members. Each member is appointed by the Governor of Missouri to serve a four-year term, with a student representative serving for two years. The ten members must meet residential requirements defined by Missouri law. The Board of Governors also includes four committees: the Finance and Audit Committee, the Budget and Capital Projects Committee, the Honorary Degrees Committee, and the Truman State University Foundation Board of Directors. The campus is located on the south side of Kirksville. Truman's main campus is situated around a slightly wooded quadrangle, also known as the "Quad." It is two blocks south of the town square, which includes an eight screen movie theatre and various eateries and other shops. Notable buildings on campus include Pickler Memorial Library, the Kirk Memorial, the Kirk Building, Magruder Hall, McClain Hall, Baldwin Hall, Violette Hall, Barnett Hall, Ophelia Parrish, Pershing Arena, the Student Union Building and the Recreation Center ("The Rec"). The oldest building is not Kirk Building, but is instead the purple doored Physical Plant building located between the Health Services building and Magruder Hall. Pickler Memorial Library was named after Samuel M. Pickler, who donated funds to rebuild the library after it was destroyed by fire in 1924. Renovated in 1993, it now houses the main computer lab, as well as approximately 500,000 volumes of various works. The front lobby area of Pickler Memorial Library is known as "the Bubble" for its curved glass atrium. Kirk Memorial is a small, domed structure near the center of campus. The structure is dedicated to John Kirk, the fifth president of the university. It formerly housed Truman's debate team and now houses a few administrative offices. The Kirk Auditorium, now known as "Kirk Building," was once the University's combined gymnasium and auditorium facility. It currently houses the Center for International Education, Student Affairs, Publications and the Department of Sports Information. The Rec is located just north of Centennial Residence Hall and is open everyday except on holidays. It also offers a gymnasium for a variety sports, a weight room, an elevated track, various exercise equipment, and a smaller, multipurpose gym for hockey, indoor soccer, etc. There are seven main academic buildings. Magruder Hall is the science building and houses the departments of Chemistry, physics, Biology and Agriculture. McClain Hall serves as both an administrative and academic building. For the academic portion, Classical & Modern Languages, Economics, English & Linguistics, History, Philosophy & Religion, and Political Science can be found there. Baldwin Hall is connected to McClain Hall and houses the campus auditorium that is best known for hosting cultural events through the Kohlenberg-Lyceum Series. Violette Hall, named after former history professor E.M. Violette, is home to the School of Business, the Mathematics and Computer Science Department and the Education Department. Ophelia Parrish is home to the Art, Music and Theatre Departments. Barnett Hall is home to the departments of Anthropology, Geography and Sociology; Communication; Justice Systems; Psychology; ROTC; and Nursing programs. Finally, Pershing Arena is for department of Health and Exercise Science classes and Communication Disorders. Services available on campus to students include the student health center, career center, and writing center. The health center is closed on the weekends and holidays. The career center is located on the third floor of the Student Union Building and provides help to students in determining a career path, selecting a major, developing career skills, helping put together a resume, or even conducting mock interviews. The writing center is located on the third floor of McClain and offers critique and editing for student papers. The student-to-teacher ratio is 16:1, with an average class size of 24, but some classes in a major may have as few as 4 to 10. Admission to the university is based upon holistic review of a candidate's academic record, with the strongest consideration being given to those who have a combined ability score of 140 or higher. The combined ability score is calculated by adding the percentage of students in the applicant's graduating class that the applicant outranks and the percentage of students the applicant outscored on a nationally standardized test (usually the ACT, although the SAT is also accepted). Admissions decisions are also based, however, on a mandatory application essay, the applicant's resume, and the applicant's high school and extracurricular record. According to the Princeton Review, Truman has a selectivity rating of 88, a 68% acceptance rate, with applicants having a 3.79 average high school GPA, and an 88% retention rate after freshman year. All applicants must have 4 credits of English, 3 credits of math, 3 credits of science, 2 credits of foreign language, 2 credits of social studies, and 1 credit of fine art. The average GPA of an admitted student is 3.25 on a 4.0 scale, with 50% of all admitted students ranking in the top 10% of their class, and the median ACT range is 25–31. Essential Skills for success in liberal studies, including courses in writing as critical thinking, public speaking, elementary functions, statistics, computer literacy and personal well-being. Modes of Inquiry by which students may approach problems and issues in other academic areas. The eight modes in the Modes of Inquiry have been separated into two separate areas Qualitative and Quantitative, each representing four academic areas. Students must complete coursework in three of the four academic areas in each category: fine arts, literature, history, and philosophy/religion are based under the Qualitative Modes while mathematics, life science, physical science and social science are under the Quantitative Modes. Interconnecting Perspectives that allow students to understand and appreciate better the knowledge they have gained. This includes taking a series of writing-enhanced courses, an interdisciplinary seminar course in the junior year, at least two semesters of a foreign language, and participating in an intercultural experience (this can be fulfilled through any one of a series of courses or by going on any study abroad trip). The School of Arts and Letters is the home of the departments of Art, Classical & Modern Languages, English & Linguistics, Music and Theatre. Degrees offered through the school include Art, Art History, Classics, English, French, German, Linguistics, Music, Romance Languages, Russian, Spanish, Theatre and Visual Communications. In addition to the 17 distinct undergraduate majors offered, the school also offers 6 graduate programs, including Music and English. The School of Business offers degrees in Business Administration (BA or BS) with emphasis in Finance, Management, Marketing and International Business (BA only). In addition, a BS and MAcc in Accounting are offered, with the graduate program ranked third in the nation in terms of CPA passage rates. The School of Business is also AACSB accredited. The School of Health Sciences & Education offers degrees Communication Disorders (graduate and undergraduate), Nursing, Health Science, Exercise Science and Education (MAE only). Education students can emphasize in elementary education, special education, English, exercise science, foreign language, music, mathematics, science and visual arts. The School of Science and Mathematics offers degrees in Agricultural Science, Biology, Chemistry, Mathematics, Computer Science, and Physics. The school also offers Missouri's only undergraduate interdisciplinary degree program in mathematical biology, and it coordinates the Missouri Pre-STEM Pathways Program with Moberly Area Community College, Metropolitan Community College - Kansas City, and St. Charles Community College. The School of Social & Cultural Studies offers degrees in Communication, Economics, History, Justice Systems, Military Science (minor only), Philosophy & Religion, Political Science, Psychology, Geography (minor only) and Sociology/Anthropology. Students are also free to create their own interdisciplinary majors or to minor in any of the approved interdisciplinary minors, which include African/African-American Studies, Asian Studies, Classical Studies, Cognitive Sciences, Disability Studies, Environmental Studies, Folklore, Forensic Science, International Studies, Italian Studies, Mathematical Biology, Medieval Studies and Women's and Gender Studies. In the 1960s, the university built Dobson Hall (1961), Ryle Hall (1963), Missouri Hall (1965) and Centennial Hall (1967). There are three other residence halls on campus: Blanton-Nason-Brewer (1948, Brewer added in 1959), Ezra C. Grim Hall (1923), and West Campus Suites (2006). The residence halls are maintained by ResLife, an administrative body of professionals and students who live in the halls and act as student advisors (SA's) and hall directors. Truman's residence halls are currently undergoing a $90 million renovation schedule. This project included the construction of West Campus Suites in 2006, the renovation of Missouri Hall in 2006, Blanton-Nason-Brewer in 2007, and Dobson in 2008. Ryle Hall's two-year renovation concluded in the summer of 2011, and Centennial is scheduled to undergo a two-year renovation starting in the summer of 2012. Dobson Hall is coed by wing and houses roughly 400 students. Dobson features community-style bathrooms, study areas, laundry facilities, air conditioning in all rooms and a convenience store, but no cafeteria. Dobson Hall is currently set to close for the 2019-20 academic year. Ryle Hall is the second largest hall at Truman. This coed residence hall houses nearly 600 students in suite-style rooms. The standard arrangement is two bedrooms, or four people, sharing one bathroom. Ryle has a spacious main lounge that is often used for on-campus events. The hall features a cafeteria, computer labs, mailboxes, vending machines, automated teller machines (ATMs), laundry rooms, and also house a classroom used by New Student Programs (NSP). Centennial Hall (commonly called "C-Hall") is the largest residence hall on campus. This coed hall houses nearly 600 students in suite-style rooms. Like Ryle, the standard arrangement is two rooms, or four people, sharing one bathroom. Centennial also has a spacious main lounge that is often used for small on-campus events. The hall features a cafeteria, computer labs, mailboxes, vending machines, ATMs, laundry rooms and also a large study lounge. The primary difference between Ryle and Centennial is that Ryle's lounge is located on the first floor with its cafeteria below, and that Centennial's cafeteria bisects the second floor, with the lounge area sitting directly below. Centennial will be the final residence hall renovation on Truman's campus, completing an eight-year renovation schedule of all of the residence halls; the hall being renovated similarly to Ryle, in 2 stages: the first from 2012 to 2013 and the second from 2013 to 2014. Missouri Hall Director Zac Burden cuts the ribbon at the ceremony honoring the building's completed renovation in 2007. The project was part of a multi-year, multimillion-dollar renovation and construction project for the residence hall system on campus. Missouri Hall (commonly called "MO Hall") is a coed residence hall that houses 518 students, making it the third largest on campus. Missouri Hall is made up of seven different wings. On both the north and south sides of the building three wings join with a common lounge. The two common lounges are linked by a seventh "crossover" wing. From overhead, the building is shaped like an elongated asterisk. While each wing is either male or female, each "house" (the north or south side of a single floor) includes both male and female wings. The building also houses a large cafeteria, study rooms, laundry facilities and many public kitchens. A renovation of Missouri Hall began in the summer of 2006 and concluded during the summer of 2007. The upgrade included improved air conditioning, renovated bathrooms, wiring upgrades, improved community space, an updated dining hall, and a new lobby. Blanton-Nason-Brewer (commonly called "BNB"), offers three floors of suite-style, coed living arrangements to students. Originally three separate buildings connected by breezeways, the building underwent a major renovation in the 2007–2008 academic year and is now one, unified residence hall. The north wing, Brewer Hall, is primarily used as sorority housing. The east and south wings, respectively Nason Hall and Blanton Hall, are used as regular housing. BNB does not have its own dining hall, so residents typically walk to Missouri Hall, which is next door. The hall offers two large lounges with fireplaces on the first floor. The second and third floors have open community lounge areas, study rooms, computer workstations, laundry facilities, trash and recycling areas, and public kitchens. Grim Hall was the smallest residence hall on campus, with a capacity of just 68 residents. It was also unusual in its hardwood flooring and house-like appearance. Originally a dormitory for nurses at the adjacent Grim-Smith Hospital, it was later acquired by the University in the 1930s. For many years Grim was also the "International Dorm" by striving to maintain a population of at least one third foreign students. Because of its small size, Grim Hall sometimes felt more like a home than a large housing complex; much of its personality came from its residents differentiating Grim from the large residence halls. Grim Hall was taken offline after the Spring 2015 semester. This building will either be demolished or used for other, non-residential purposes, as decided by the Board of Governors in 2016. West Campus Suites, just northwest of Centennial Hall, opened its doors to 416 students in Fall 2006. Currently, all floors are coed by suite. Each room (with the exception of single rooms for eight student advisors and apartments for the hall director and community coordinator) consists of two bedrooms attached to a central living room, sink, kitchen cabinets and large bathroom. All suites have individual central air conditioning. Each floor has its own dedicated lounge, 2 study rooms, laundry facilities, trash and recycling center, campus events bulletin board, and computer labs. A favorite amenity of students is the convenience store located off of the main lobby. Truman offers the option of two campus-owned apartments for student living: Randolph and Campbell. Both of these apartment complexes provide residents with a kitchen area. Campbell is located next to the tennis courts, and Randolph is located behind Dobson Hall. There was a third apartment complex, Fair, but it was demolished in 2018. Yet another option is Farm Hall, located at the University Farm. Only a handful of students, often majors in agricultural science, live here each year. Their work on the farm helps them gain useful first-hand experience, as well as help pay for room and board. An organization that has garnered considerable attention since its inception is the Bulldog Student Investment Fund, a group in which student analysts invest a portion the university's endowment in public equities (stocks) in an effort to outperform the market. The organization hopes to eventually use the proceeds from the fund's returns to sponsor scholarships for Truman students. In 2015, members from the Bulldog Student Investment fund, representing Truman State, achieved the first place prize among the five competing universities in the St. Louis CFA Institute Challenge and went on to compete at nationals. Approximately 20% of the student body is affiliated with a social Greek organization. Truman hosts eleven sororities and sixteen fraternities. The organizations do service around the community, provide leadership on campus, and provide a social outlet for students. Truman also offers a wide selection of honorary organizations. Pershing Society - An organization for students awarded the Pershing Scholarship, the University's most prestigious award. Truman enrolls students from all over the world. According to 2009 figures from the International Student Affair Office, 309 students represent 45 countries, including Nepal, China and Vietnam. The weather vane atop Kirk Memorial is welded in place so that it will always point northeast, in honor of the school's previous name and its location. In 2012 a large capital letter "F" was created in the concrete on the East walkway into Violette Hall. It is rumored that if you enter through this entrance on the day of a test, you will fail the test. Students recommend that you walk around to another entrance on test days, even if it makes you late. "The Ghost of Centennial Hall" is named "Joan," who has been said to be a student killed in an auto accident in the 1970s. In addition, "Charlotte" and an unnamed little boy have haunted Grim Hall for 70 years, and "Gina" watches over the women of Ryle. See external link "Truman Ghost Stories," below. Students traditionally stuck their chewing gum on a redbud tree on the east side of campus. This "gum tree" was decorated in colorful wads, and at times, it even sported students' names. Lore has it that the concept of the gum tree originated in the 1920s when it was against the rules to chew gum in class. The tree was vandalized and knocked down by an unknown party in 2000, but students quickly adopted another tree. The sunken garden, site of many student weddings, is actually the cellar left from the Baldwin Hall fire of 1924. Due to the frequency of student weddings in the sunken garden, a campus myth came into common circulation. It is alleged that if a new couple has their first kiss at midnight on one of the two benches located in the sunken garden, the couple will eventually get married. A row of large, clapperless bells is fixed in a brick wall on the quad. The Bell Wall was built and dedicated at the Centennial Celebration in 1967. The bells were donated by Joe Burdman, local businessman and University benefactor. The historic bells were collected from abandoned churches, schoolhouses and public buildings in northeast Missouri. Each bell was meant to represent the ideals of liberty, justice, religion, and education. The annual football game against Northwest Missouri State University was established in 1930 when Northwest president Uel W. Lamkin sent Fair a polished hickory stick from the farm where the former president Eugene Fair was born. The "Hickory Stick" was contested annually until 2013, when Truman and Northwest Missouri began competing in different athletic conferences. For many years, an irregularly shaped portion of sidewalk (which had previously been home to a tree) was called the "sacred potato," and was the focus of a number of rituals and superstitions: one should never step on it if one had a test that same day; sticking a knife into a potato on the spot at midnight warded off a failing grade. Stepping on the sacred potato had been rumored to cause one to either fail their next test or become pregnant. Around 2002, campus facilities replaced the sidewalk, sparking student complaints. The statue of President Truman formerly located in Pickler Memorial Library was said to bestow good fortune on any student who borrowed a penny from his hat for a test. However, lore held any good fortune would be negated if the penny was not returned the same day. These 'Truman Pennies' were placed by students studying for tests in the library, and it was also considered good luck to place a penny in the hat. However, the statue was moved to the new Ruth Towne Museum and Visitors Center (named after long-time faculty member Dr. Ruth Warner Towne, who donated $1 million to create the museum of University and northeast Missouri artifacts) on the corner of Normal and Franklin just north of campus. Army Reserve Officers' Training Corps (Army ROTC) was established at Truman in 1969. Approximately, 200 Truman students are members of the "Bulldog Battalion" and enroll in military science courses each semester. Students completing the ROTC program are additionally awarded a minor in Military Science. Truman is a member of NCAA Division II and plays in the Great Lakes Valley Conference (GLVC), joining the conference in 2013 after having been a member of the Mid-America Intercollegiate Athletics Association (MIAA) since that league's creation in 1912. Because the GLVC did not sponsor wrestling until the 2016–17 season, that team remained in the MIAA. The athletic department sponsors 18 teams, ten each for men and women. Among Truman's most recent successes include: four regional championships for women's volleyball, a regional berth for men's basketball in 2006, a College World Series appearance for baseball, and undefeated regular seasons for both men's and women's soccer. The women's swim team won six consecutive NCAA Women's Swimming and Diving Championships national titles for Division II between 2001 and 2006 and won again in 2008 again beating their in state rival Drury University. ^ "History - Truman State University". Truman.edu. Retrieved 2016-08-19. ^ "Endowment Value". Truman State University. Retrieved May 14, 2016. ^ a b c d "Truman State University At a Glance". Truman State University. Retrieved February 12, 2017. ^ a b c d "Fast Facts Infographic". Truman State University. Retrieved February 12, 2017. ^ "Truman State University: At a Glance". Truman State University. Retrieved May 14, 2016. ^ Guidelines for Using Logo | Truman State University. Retrieved 2015-10-19. ^ "Truman State University". princetonreview.com. Retrieved June 24, 2015. ^ a b c d e "Historical Timeline". Truman.edu. Retrieved Oct 9, 2014. ^ "Truman State University". rankingsandreviews.com. Retrieved May 14, 2016. ^ "Board of Governors - Truman State University". Retrieved October 31, 2016. ^ "History of Pickler Memorial Library". Truman.edu. Retrieved Oct 9, 2014. ^ "Truman State University". Princetonreview.com. Retrieved February 12, 2017. ^ "Truman State University". U.S. News. Retrieved February 12, 2017. ^ "About the School of Arts & Letters". Retrieved June 24, 2015. ^ "About the School of Business". Truman State University. Retrieved June 24, 2015. ^ "About School of Health Sciences & Education". Truman State University. Retrieved June 24, 2015. ^ "About the School of Science and Mathematics". Truman State University. Retrieved June 24, 2015. ^ "MathBio". Retrieved October 31, 2016. ^ "Pre-STEM Pathways Program". truman.edu. Retrieved June 24, 2015. ^ "About the School of Social & Cultural Studies". Truman State University. Retrieved June 24, 2015. ^ "Interdisciplinary Studies Majors & Minors -Truman State University". Retrieved October 31, 2016. ^ "Housing at Truman State University". Retrieved October 31, 2016. ^ "Dobson Hall to close after current semester". Retrieved February 22, 2019. ^ Fisher, Holly. "The sun sets on Ezra C. Grim Hall » Truman Media Network". Tmn.truman.edu. Retrieved 2016-08-19. ^ Truman State University Board of Governors Official Minutes (PDF). 2016-01-27. Retrieved 2016-08-18. ^ "Bulldog Student Investment Fund". truman.edu. Retrieved June 24, 2015. ^ "CFA Institute". Cfasociety.org. Retrieved 2015-07-17. ^ "Greek Life". Retrieved October 31, 2016. 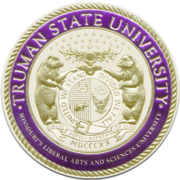 ^ "Honor Societies | Truman State University". Honors.truman.edu. Retrieved 2013-10-22. ^ "University Traditions-Weathervane". Library.truman.edu. Retrieved 2013-10-22. ^ "University Traditions- Gum Tree". Library.truman.edu. 2013-07-11. Retrieved 2013-10-22. ^ "University Traditions- Gum Tree". Library.truman.edu. 2013-07-11. Retrieved 2014-04-16. ^ "University Traditions- Hickory Stick". Library.truman.edu. 2011-03-28. Retrieved 2013-10-22. Wikimedia Commons has media related to Truman State University.